It is said his motive was to sell more auto products. After all, that is what Richard Hollingshead did for a living back in the 1930s. And, he theorized, the best way to do this was to establish a place where people could park their cars, enjoy a meal, and watch a movie outdoors. He experimented by nailing a bed sheet between some trees, put a 1928 movie projector on the hood of his car, and placed a radio behind the screen for sound. He even positioned a number of automobiles with blocks under their front wheels to improve viewing. There would be other experiments along the way, including the use of lawn sprinklers to simulate the effects of rain while watching a movie outdoors. Eventually, Hollingshead had the makings of his drive-in. In August of 1932 he applied for a patent. 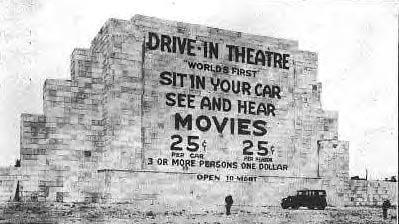 Richard Hollingshead opened the world's first Drive-in Theatre in Camden, New Jersey on June 6, 1933. Its successful debut prompted others to follow. The second drive-in appeared less than one year later in Orefield, Pennsylvania. Shankweiler's Auto Park opened on April 15, 1934 and is the oldest continuously operated drive-in theatre in America. By 1942, there were almost one hundred drive-ins scattered across 27 states. It wasn't until after the Second World War, however, when drive-ins really spread across the country. Part of the reason was improved technology. RCA introduced in-car speakers, which replaced the old and inefficient bullhorns mounted on the drive-in screen. By 1948, there were an estimated 820 drive-ins. With the baby boom of the late 1940s and early 1950s, young families began discovering the drive-ins. Many drive-ins added playgrounds and train rides to encourage family attendance. Just like the generation itself, drive-ins were also booming. Concession stands were a large part of the draw and success enjoyed by drive-in owners. Utilizing a cafeteria-style operation they could feed hundreds of kids and adults during the 10 minutes of intermission, which sometimes featured cartoons and a clock counting down the time to the beginning of the second feature. The 1950s brought other innovations to drive-ins, like in-car heaters and mobile concession carts. However, their appeal was still driven by the casual and convenient alternative they offered to traditional indoor movie houses. You could put the kids in their pajamas and spend a cool summer evening at the drive-in, rather than heading for the city and a stuffy indoor theatre. By 1958, there were approximately 4,063 drive-in theatres in the United States and Canada. But their impressive growth and success was about to change direction, and the decline would last for three decades. Some industry leaders will tell you the biggest reason for this decline was the introduction of daylight savings time. Many parents were reluctant to take their families to the drive-in for showings starting as late as ten o'clock at night. And, with the baby boom era coming to an end, there were simply fewer families with children to bring. Many drive-in operators switched to more adult or occult films. Some also tried to improve their bottom line with flea markets or church services during the daytime on the weekends. The 1970s and 1980s brought fierce competition with the infiltration of cable TV and VCRs into many homes. To make matters worse, many new indoor movie theatres were being built in the suburbs, with multiplexes offering more screens and more movies. Now, people could watch a film in air-conditioned theatres and grab a bite to eat at the mall instead of the drive-in snackbar. In the face of it all, many drive-ins decided they were better off selling their land to commercial developers, who built an endless number of bland shopping centers over the grass lots of former drive-ins. Land that wasn't sold frequently stood idle, overgrown with weeds or even trees, the once mighty screen tower now a lonely monument to the glory days when drive-ins were king. By 1990, only about 910 drive-ins remained open in the entire United States. Fortunately, the story doesn't end there. In more recent years, a number of once-closed drive-ins have re-opened and several new ones have been built from the ground up. Operators who survived the difficult years are re-investing in multiple screens and modern FM radio sound. Playgrounds, miniature golf, and other forms of family entertainment have reappeared in many. It seems a whole new generation has discovered drive-in movie theatres. Richard Hollingshead, the man who started it all, would be proud that his invention has withstood the challenges of time and cultural change, and still exists today providing affordable family entertainment for communities across America to enjoy.